Ford Racing Engineers have designed the replacement for the legendary BOSS 302 block using the latest technology and manufacturing techniques from both the production and racing worlds. The BOSS block capability has been proven abound the world – both on the track and on the street. By preserving many of the dimensions and features from the original 289-351 blocks, the BOSS blocks are compatible as replacements for use in just about any vehicle that used a Windsor style engine. 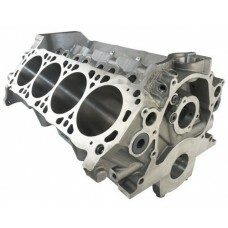 Cast from diesel grade iron and designed with added material in key areas, BOSS block strength is far superior to any Ford OE block ever produced. 4.125" bore capacity, finished at 3.990" to 3.995" rough bore. 8.2" deck height, finished at 8.200" plus .010" to .015"
NASCAR inspired front oil feed on both lifter galleys.